The winter season can be a time for both car development and development of sponsorship links, as demonstrated by the Creation Autosportif team’s recent activities. You’ve probably seen this image already – of Mike Jankowski and Jamie Campbell-Walter staring intently at the right rear wheelarch of the Creation chassis that last raced at Jarama in September. Mike Jankowski, and Ian Bickerton, have already explained how they needed all the support that Michelin could provide this year, to enable them to race effectively on the smaller tyres, but here’s half of the solution – with this chassis obviously being prepared to run in hybrid form. 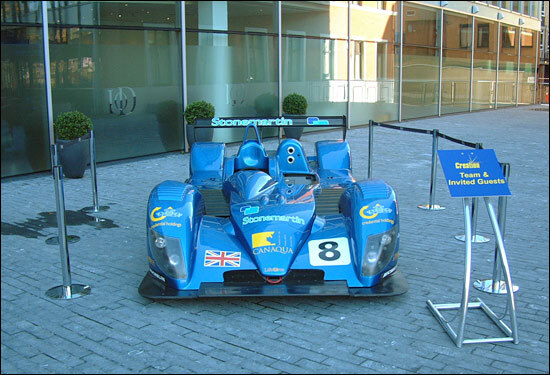 It’s pictured outside the very impressive offices of the team’s sponsor Stonemartin – in Forbury Square in Reading, on Saturday morning (November 18). “We’ve been working with Stonemartin for two years,” explains Mike Jankowski. “Today is the company’s annual conference, and all the staff are going out to dinner this evening. The theme of the conference is “Evolving”, and Jamie and I will both be addressing the staff this afternoon. 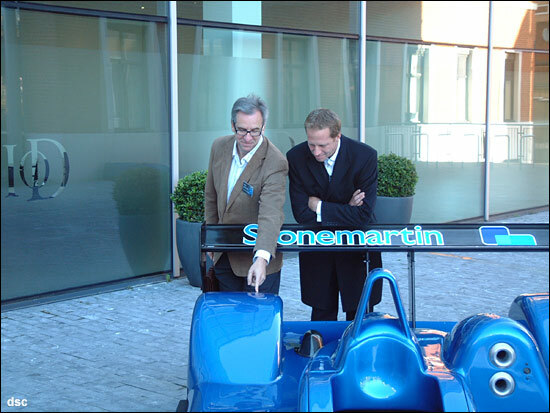 “Stonemartin provides office space – in fact much more than that – to top companies. They provide everything that a company might need: so that’s office space and facilities, conference facilities – basically a 5 star service. “The connections with what we do as a team are the attention to detail that we both strive for – basically striving for excellence – and the fact that we both ‘punch above our weight’. Colin Peacock is the Stonemartin founder and MD, and it’s a real asset to him to use a Creation prototype as a focus for events such as his company’s annual conference. 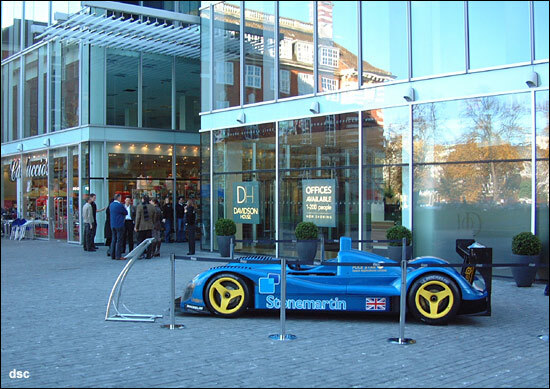 “We had one of the cars on display at our offices in the city earlier this year: the team had to break the car down into its components to get it into the building, then build it up again. The car becomes a real focus for the event, and the staff can climb into it, and really get a feel for a machine like this. Of course we take staff to the races, but having Mike and Jamie here today means that everyone can really understand what it’s like to be a part of a racing team like this. “We’ve also met some very interesting people through our involvement with the team. Essentially, we’re breaking with tradition in the way we provide office space – and the Creation team is breaking with tradition in the way it goes racing. Stonemartin is certainly innovative in the way it inspires its staff, who have all been making DVDs recently, working in teams. The task for each group was to record a song, and make a video to go with it. They were all going to see the results for the first time later on Saturday. Somehow, in the process, they were all raising money for the Variety Club in the process. Saturday morning saw them working in small groups, the task for each being to build something to support a champagne bottle – the bigger and taller the better. 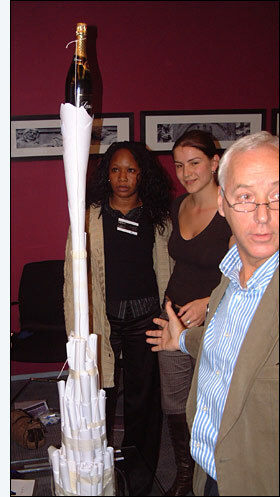 The photograph shows the winning design. Great fun was had by all – and inevitably, the contents were going to be consumed on Saturday evening. Creation’s next non-racing activity will be in Monaco next month, for a motorsport business forum, and we’re expecting more team news at that event.